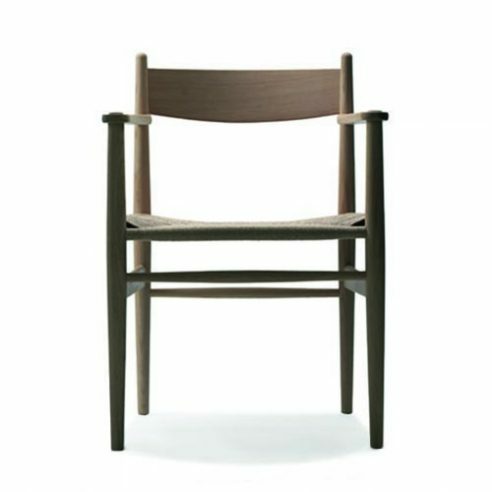 Wegner particularly found inspiration in the archetypal Shaker chair that consists of a slender – but strong – wooden frame with straight angles, a woven seat that is penetrated by the legs in the two front corners, and three or four wide transverse rails in the back. Apart from a tilt of a few degrees, the sitting position is upright. There is absolutely nothing superfluous about CH37. It is light, taught, rectilinear, with a woven seat and slightly angled back providing little opportunity to shift one’s sitting position. The underframe, strechers, legs and seat are quite reminiscent of the Wishbone Chair, another dining room chair made by Carl Hansen & Son, yet because of the Wishbone Chair’s open, round sculptural top, the two appear to be diametrical opposites.